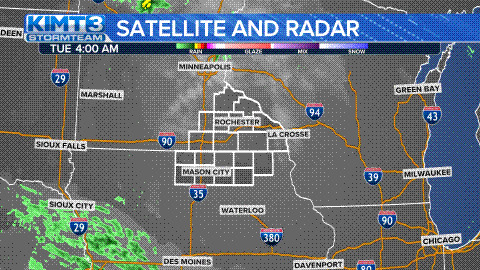 The National Weather Service said Tuesday morning that a radar reading shows rainfall of up to 6 inches have fallen since midnight. A flash flood warning has been issued for northeast Iowa. The National Weather Service said Tuesday morning that a radar reading shows rainfall of up to 6 inches (15 centimeters) have fallen since midnight. Some flooding is expected in several communities, including Elkader and Postville. Flood watches also have been posted for much of northeast and eastern Iowa. Cedar Rapids officials say some homes were damaged and trees and power lines were knocked down by what may have been a tornado on the northwest side of the city. No injuries have been reported. A funnel cloud was reported a little after 9 p.m. Monday. The weather service is sending a storm survey crew to determine whether the damage was caused by straight-line winds or a tornado.